Week 6. Time is moving right along. Continuing the COUNTING theme. We started, as usual, with The Name Song and Little Mouse, Little Mouse (neither are listed…too many words for the PreK children!). These two stories were PERFECT for the PreK set. Sergio Ruzzier’s Two Mice was both simple and complex, as there were many places for inferencing and predicting. Mac Barnett’s Count the Monkeys was, as usual, an interactive gem. Picking books that give opportunities to talk and move will serve you (and your little learners) well! Continuing the Author Study with Peter Brown. The best part of this week’s lesson was the BRAIN question: what surprised you? So many surprises, from Tiger walking on all four legs to getting undressed to going back to the city. Open ended questions like these allow all students to participate without fear of being “wrong”. Notice that this week, I left off the bottom of the spine label AND the period from the underlined title. This was a teachable moment – it took about 90 seconds and will be part of the review for the next 2-3 months. First: reading for the sake of reading. No agenda, no questions, no work…purely a story to enjoy. Next: Book BINGO! More about that HERE. 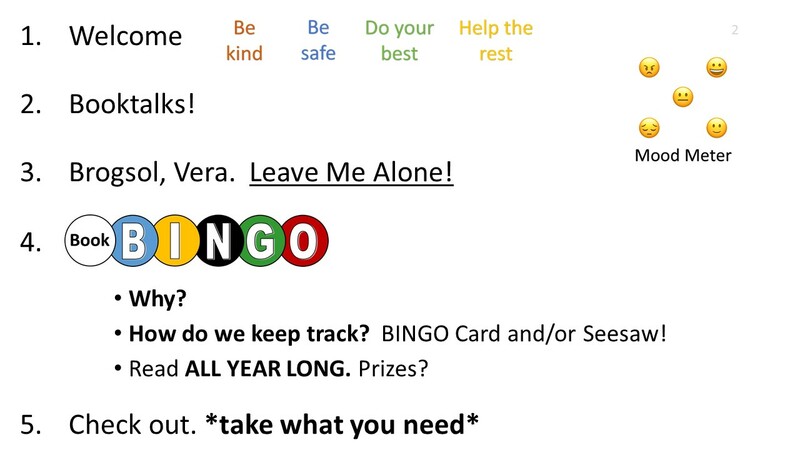 Know that some of the BINGO sections were chosen to match last week’s Scavenger Hunt. 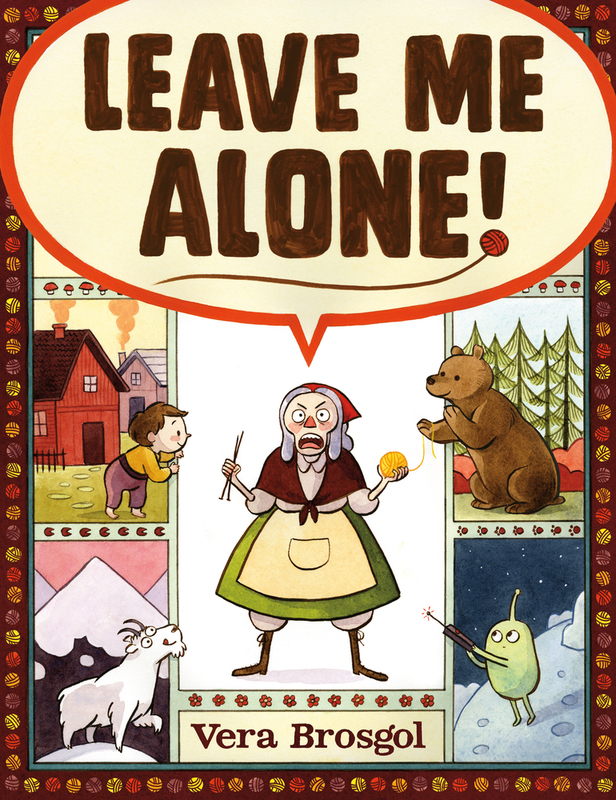 Students should now know where to find Fairy/Folk Tales, series, nonfiction. Next time, I’ll add biographies and poetry to the hunt! After sharing the goals of BINGO, I booktalked 2-4 titles that would be great fits for their BINGO board. From titles like Ready, Freddy! to Bunjitsu Bunny to Mercy Watson, many books were getting checked out to support the BINGO board. Book BINGO was the big lesson, followed by booktalks and goal-setting (which BINGO column would be their first to tackle). Some background: SO many of these students wanted to know why we weren’t doing Battle of the Books (which was done by the previous librarian). Short answer: because we’re doing something that allows everyone to participate. Longer answer: BINGO supports all language learners as books can be read in any language. It allows students to achieve success if they move mid-year. Extra copies of the same books don’t need to be purchased. Books can be in any language and from anywhere. MORE books and a wider variety of books are read with Book BINGO than in Battle (where the same 6 titles are repeatedly read). No class time is needed to run BINGO, as compared to Battle. No extra meetings need to take place. Diverse titles are supported in BINGO (though, as an international school, diversity is already a big part of their lives). 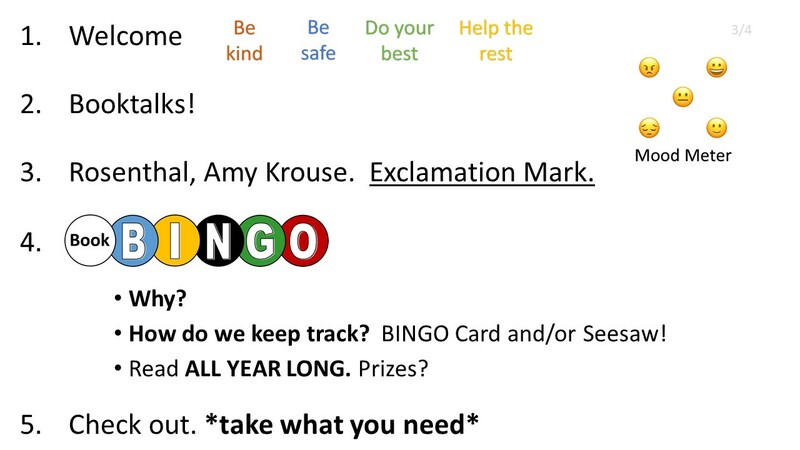 I love that everyone – adults and students alike – can participate and succeed and grow with Book BINGO! This entry was posted in School library lessons and tagged book bingo, counting books, library author studies, Peter Brown on October 8, 2017 by ajdickens. Week 5! The time is flying. New unit: COUNTING. 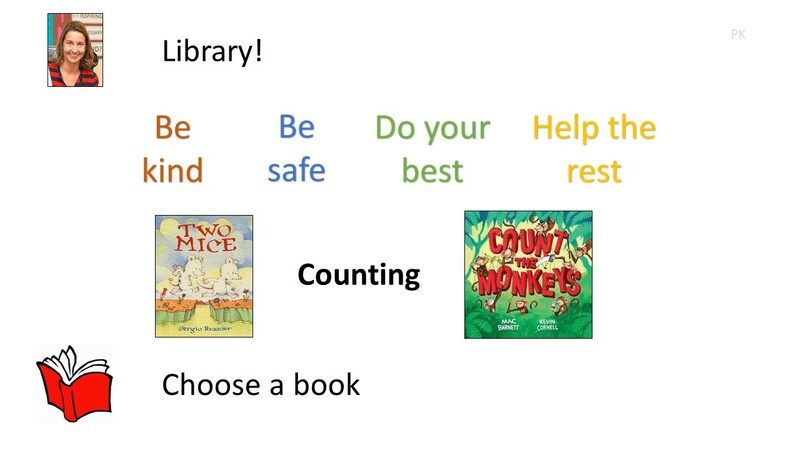 We started with The Name Song, then did the Little Mouse, Little Mouse color/counting/guessing rhyme from last week (note: I always hide the mouse before they come in. My pieces are magnetic, too). They were so excited to play this game again! We’ll use it one more time before changing it up. Patterns and repetition works with the littles. Made in my long-ago days as a preschool storytime librarian! Stories included another Pete the Cat – this time, with his four groovy buttons. And Doreen Cronin’s counting adventure Click Clack, Splish Splash gave good opportunity to talk about what was actually happening in the story and why it was happening. Why were the ducks sneaking? Why was it important that the farmer was sleeping? Building in opportunities for children to think and wonder about their reading at a young age will serve them well as they grow as readers. You may notice our main slide doesn’t include much of this work. Why? Too many words/images. I keep it simple for the pre-K’s visual needs. More isn’t always better. 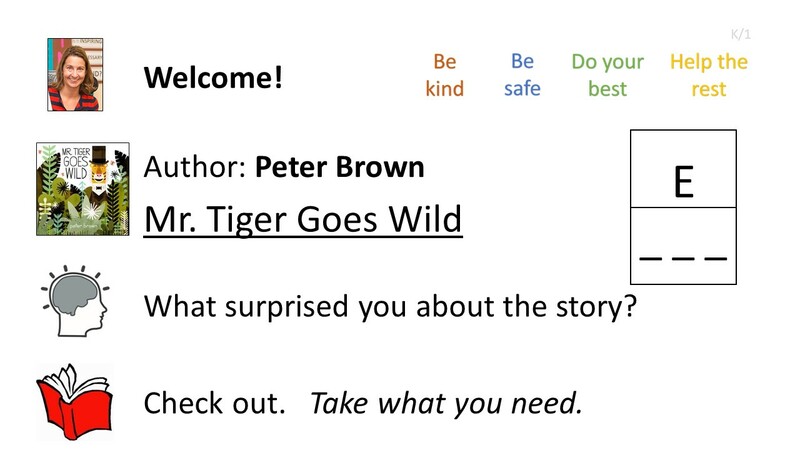 Author study: Peter Brown. Intro song: The Name Song. This week: My Teacher is a Monstert! (no, I am not). No image was put on the slide…and here’s why: I forgot! Noticing this error before the class came in, I could’ve added it, but I chose to use it as a thinking question moment. After sitting down, students talked with knee-neighbors about what they think a teacher-monster would look like. Ideas included sharp teeth, rough skin, purple or green, big size, pointy nails and more. This was a perfect way to build an open-ended question into the lesson and engage all students. 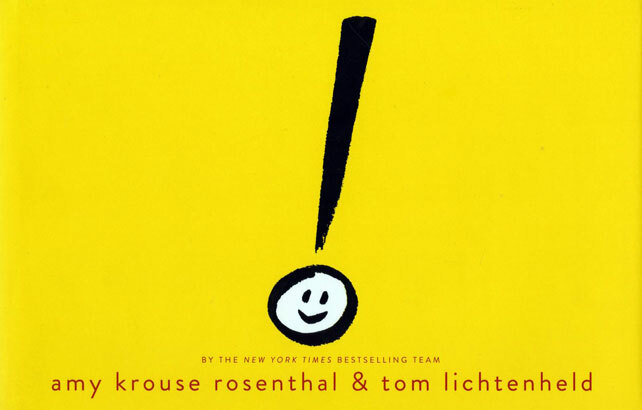 Know that each week, prior to check out, we review expectations related to self-checkout and locating books (using our shelf marker, how to scan the barcodes, etc). It takes 2-3 minutes, but I’m taking time at the beginning to reinforce and review. One of my favorite sayings in teaching is “go slow to go fast.” Slow down at the beginning of the year (and week 5 is still the beginning!) and work with intention to teach the skills and behaviors you really value and that will ultimately benefit the child. 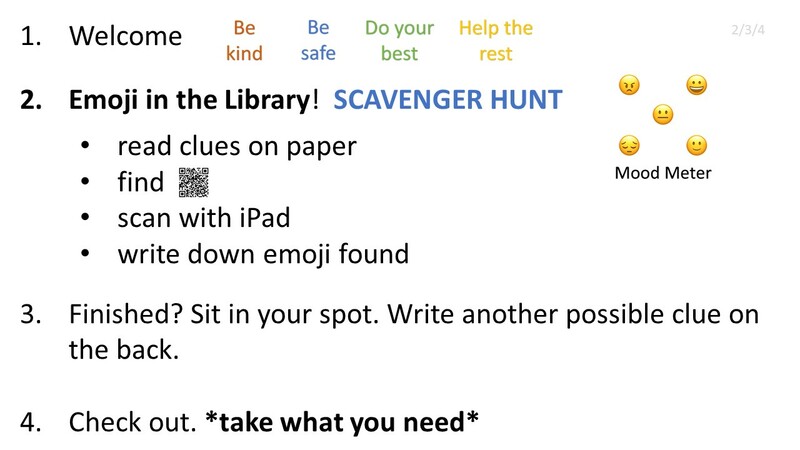 Emoji Scavenger Hunt! After last year’s Pokemon Go to the Library hunt, I chose to edit the clues and streamline the hunt into a single hunt for all grades. What I learned: it was perfect for grade 3 learners, a little too easy for grade 4 and too long (though not too hard) for grade 2. 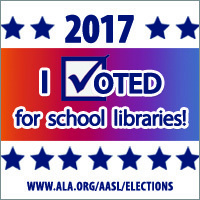 But, my assessment was informal: at the end, students were asked if they found a space in the library that they didn’t know about…and 95% of students answered YES. Success, even if they didn’t complete the hunt. Students did the hunt with a teacher-selected partner. 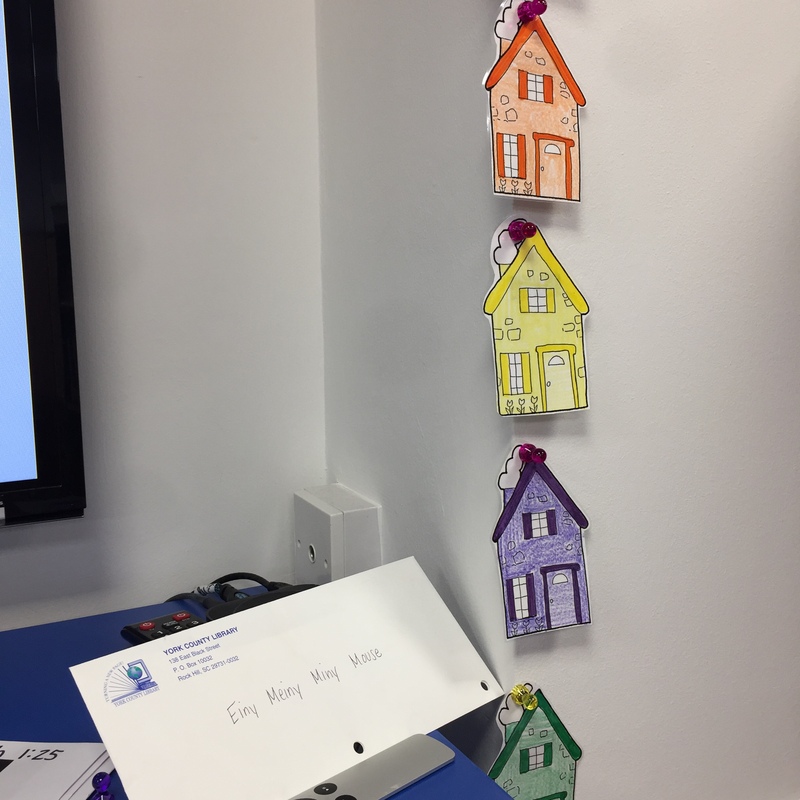 The reasons partners are teacher-selected are many, but the big ones are: 1 – it eliminates fretting over “who will be my partner?”; 2 – it keeps kids focused on directions, as they’re not fretting about finding a partner; 3 – students who need specific partners (a strong reader with a student who struggles; a student who speaks Italian with the student who speaks multiple languages) can be placed together and not left out. Full procedures for how to do the hunt are found in the Pokemon link above, including a timeline of how it looks in a 40 minute class. This year there was a bonus question: if students finished early, they were to think of a clue I could’ve asked. There were some great ones: where the family photos are hanging, where the daily directions are found, a cozy spot with a rooftop. These are all places in our library that they found important and meaningful. I’d also include the E section (who knows why I left it out! ), poetry, and more nonfiction. 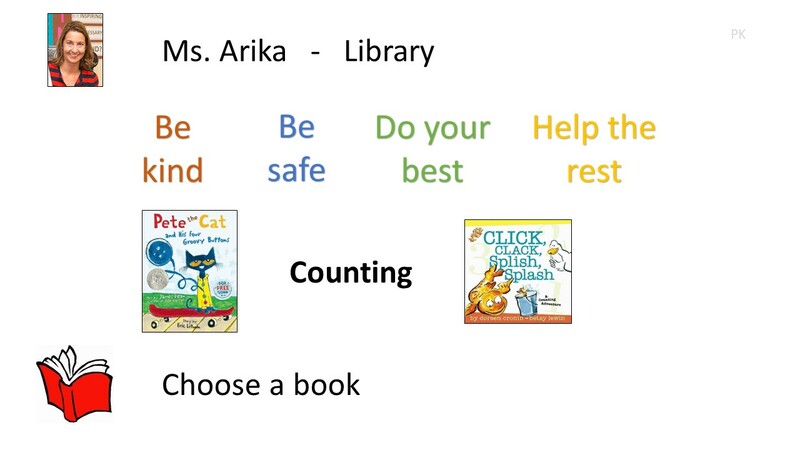 This entry was posted in School library lessons and tagged counting books, elementary library lessons, library author studies, library scavenger hunt, Peter Brown on October 8, 2017 by ajdickens.